The King of Pentacles is a seasoned – experienced business man – he might as well be called King Midas as he turns everything he touches to gold (riches of all kinds). He finds opportunity everywhere and succeeds at whatever he sets his mind to. He’s a jack-of-all-trades – and master of all as well. He is always dependable and responsible. Others rely on him completely because he never fails them. He gives generously of his time and resources because he knows that by giving more, you receive more. And, he encourages others in their accomplishments and lends his support whenever it is needed. He has a steady and even temperament that adds an element of stability to any situation. 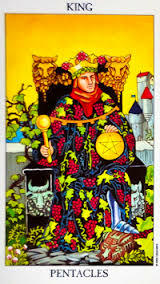 In a tarot reading this shows that he has set a goal for himself, he pursues it with firm resolve until he’s successful. The King of Pentacles can be stubborn and slow-moving, but he is patient and persevering. He will always bring a practical solution to complicated problems. Financial security is a clear goal in the life of this king. Steady, reliable business person – Making money – sponsoring a new enterprise – Finds opportunity everywhere – Real estate and finances and property matters are his favorite subject. Sugar daddy is on the way! – This King is an excellent omen with regard to love. Yes, try to put your best foot forward, but don’t pretend to be someone that you are not. This person will love you for exactly who you are. Works toward a goal – Avoids mood and behavior swings – Has regular habits and activities – Maintains calm, even approach – is a stabilizing influence.